Microsoft Intraday: bullish bias above 50.3. Our preference: long positions above 50.3 with targets @ 53.4 & 54 in extension. Alternative scenario: below 50.3 look for further downside with 49.25 & 48.2 as targets. Comment: the RSI is bullish and calls for further upside. MSFT is showing an inverted head and shoulders pattern. Apple Intraday: continuation of the rebound. Our preference: long positions above 97 with targets @ 102.75 & 106 in extension. Alternative scenario: below 97 look for further downside with 93.4 & 92 as targets. 58.9 is our pivot point. Our preference: the downside prevails as long as 58.9 is resistance. Alternative scenario: the upside breakout of 58.9 would call for 62.6 and 64.8. Comment: the RSI is below 50. The MACD is negative and below its signal line. The configuration is negative. Moreover, the share stands below its 20 and 50 day MA (respectively at 56.81 and 61.48). Our pivot point is at 21.9. Our preference: the downside prevails as long as 21.9 is resistance. Alternative scenario: the upside breakout of 21.9 would call for 22.8 and 23.3. Comment: the RSI is trading below 30. This could mean that either the stock is in a lasting downtrend or just oversold and that therefore a rebound could shape (look for bullish divergence in this case). The MACD is negative and below its signal line. The configuration is negative. Moreover, the share stands below its 20 and 50 day MA (respectively at 22.48 and 23.52). Our preference: long positions above 91 with targets @ 105 & 110.7 in extension. Alternative scenario: below 91 look for further downside with 82 & 73 as targets. Our preference: short positions below 96 with targets @ 87 & 85 in extension. Alternative scenario: above 96 look for further upside with 102.55 & 105 as targets. Comment: the RSI is mixed to bearish. Prices broke below stong support. Our pivot point stands at 32.9. Our preference: the downside prevails as long as 32.9 is resistance. Alternative scenario: the upside breakout of 32.9 would call for 35 and 36.2. Comment: the RSI is below 50. The MACD is negative and below its signal line. The configuration is negative. Moreover, the share stands below its 20 and 50 day MA (respectively at 33.24 and 35.18). Huaneng Power (ADR) is currently trading near its 52 week low at 30.08 reached on 20/01/16. Our pivot point stands at 2.83. Our preference: short term rebound towards 5.15. Alternative scenario: below 2.83, expect 2.33 and 2.04. Comment: the RSI is below 50. The MACD is negative and above its signal line. The configuration is mixed. Moreover, the share stands below its 20 and 50 day MA (respectively at 4.2 and 5.54). Re: One Hot Stock Picks ! Our preference: long positions above 726 with targets @ 762 & 777 in extension. Alternative scenario: below 726 look for further downside with 713 & 701 as targets. Our preference: short positions below 96 with targets @ 92 & 90 in extension. Alternative scenario: above 96 look for further upside with 98 & 101 as targets. Our pivot point stands at 61.1. Our preference: short term rebound towards 67.7. Alternative scenario: below 61.1, expect 58.9 and 57.5. Comment: the RSI is below its neutrality area at 50. The MACD is above its signal line and negative. The configuration is mixed. Moreover, the share stands below its 20 and 50 day MA (respectively at 64.51 and 67.74). Our pivot point stands at 107.5. Our preference: the upside prevails as long as 107.5 is support. Alternative scenario: below 107.5, expect 106.7 and 106.1. Comment: the RSI is above 50. The MACD is above its signal line and positive. The configuration is positive. Moreover, the stock is above its 20 and 50 day MA (respectively at 107.34 and 106.6). iShares Barclays 7-10 Year Treasury Bond is currently trading near its 52 week low at 103.76 reached on 10/06/15. Our pivot point stands at 93.8. Our preference: short term rebound towards 102.5. Alternative scenario: below 93.8, expect 90.8 and 89.1. Comment: the RSI is below its neutrality area at 50. The MACD is negative and above its signal line. The configuration is mixed. Moreover, the stock is trading under both its 20 and 50 day MA (respectively at 96.98 and 98.76). Our pivot point stands at 107.1. Our preference: short term rebound towards 121.5. Alternative scenario: below 107.1, expect 102.5 and 99.9. Comment: the RSI is below its neutrality area at 50. The MACD is negative and above its signal line. The configuration is mixed. Moreover, the share stands below its 20 and 50 day MA (respectively at 113.24 and 114.87). 10.02 is our pivot point. Our preference: the downside prevails as long as 10.02 is resistance. Alternative scenario: above 10.02, look for 10.79 and 11.25. Comment: the RSI is below 30. It could either mean that the stock is in a lasting downtrend or just oversold and therefore bound to retrace (look for bullish divergence in this case). The MACD is below its signal line and negative. The configuration is negative. Moreover, the stock is trading under both its 20 and 50 day MA (respectively at 9.94 and 10.11). Our pivot point is at 1.33. Our preference: short term rebound towards 1.92. Alternative scenario: below 1.33, expect 1.11 and 0.97. Comment: the RSI is below 50. The MACD is negative and above its signal line. The configuration is mixed. Moreover, the share stands below its 20 and 50 day MA (respectively at 1.54 and 1.61). Yum! Brands Intraday: further advance. Our preference: long positions above 70.3 with targets @ 73 & 73.75 in extension. Alternative scenario: below 70.3 look for further downside with 69 & 67.4 as targets. Starwood Hotels & Resorts Intraday: further advance. Our preference: long positions above 59.8 with targets @ 63.8 & 65.6 in extension. Alternative scenario: below 59.8 look for further downside with 58.3 & 57 as targets. Our pivot point is at 19.8. Alternative scenario: below 19.8, expect 18.8 and 18.2. Comment: the RSI is above 50. The MACD is negative and above its signal line. The MACD must break above its zero level to trigger further gains. Moreover, the stock is trading above its 20 day MA (19.99) but under its 50 day MA (21.44). Our pivot point is at 12.9. Alternative scenario: the downside breakout of 12.9 would call for 12.3 and 11.9. Comment: the RSI is above its neutrality area at 50. The MACD is above its signal line and negative. The MACD must break above its zero level to trigger further gains. Moreover, the share stands above its 20 day MA (13.13) but below its 50 day MA (14.14). 60 is our pivot point. Our preference: as long as 60 is not broken down, we favour an upmove with 71 and then 73.6 as next targets. Alternative scenario: below 60 expect a drop to 58.25 and 56. Comment: A bullish reversal pattern in inverted head-and-shoulders is confirmed. Furthermore, a golden crossover is identified between the 20-day and 50-day simple moving averages, the second one even playing a support role. Our pivot point stands at 66.6. Our preference: our next up target stands at 79.1. Alternative scenario: the downside breakout of 66.6 would call for 62.8 and 60.5. Comment: the RSI is above 50. The MACD is above its signal line and negative. The MACD must break above its zero level to call for further upside. Moreover, the stock is trading above both its 20 and 50 day MA (respectively at 65.74 and 70.26). 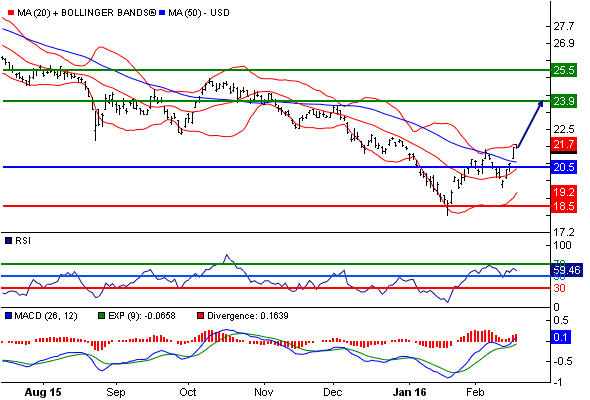 Finally, Schlumberger has crossed above its upper daily Bollinger band (71.72). Our pivot point is at 3.89. Alternative scenario: above 3.89, look for 4.23 and 4.44. Comment: the RSI is below 50. The MACD is below its signal line and negative. The configuration is negative. Moreover, the stock is trading above both its 20 and 50 day MA (respectively at 3.52 and 3.45). Our pivot point is at 3.95. Alternative scenario: below 3.95, expect 2.99 and 2.41. Comment: the RSI is above its neutrality area at 50. The MACD is negative and above its signal line. The MACD must break above its zero level to call for further upside. Moreover, the share stands above its 20 day MA (3.97) but below its 50 day MA (5.25). Best Buy Intraday: technical rebound in a bearish trend. Our preference: short positions below 30.5 with targets @ 26.95 & 25.4 in extension. Alternative scenario: above 30.5 look for further upside with 31.25 & 32 as targets. TripAdvisor Intraday: the downside prevails. Our preference: short positions below 72.5 with targets @ 62.5 & 61.6 in extension. Alternative scenario: above 72.5 look for further upside with 75.75 & 78.5 as targets. Our pivot point is at 24.6. Alternative scenario: the downside breakout of 24.6 would call for 22.9 and 21.9. Comment: the RSI is above its neutrality area at 50. The MACD is above its signal line and negative. The MACD must break above its zero level to trigger further gains. Moreover, the stock is trading above its 20 day MA (25.65) but under its 50 day MA (28.17). Our pivot point stands at 16.7. Alternative scenario: the downside breakout of 16.7 would call for 15.7 and 15.1. Comment: the RSI is above 50. The MACD is above its signal line and negative. The MACD must break above its zero level to call for further upside. Moreover, the share stands above its 20 day MA (17.23) but below its 50 day MA (18.2). 292.8 is our pivot point. Our preference: the downside prevails as long as 292.8 is resistance. Alternative scenario: the upside breakout of 292.8 would call for 303.3 and 309.8. Comment: the RSI is below its neutrality area at 50. The MACD is below its signal line and negative. The configuration is negative. Moreover, the share stands below its 20 and 50 day MA (respectively at 295.37 and 304.73). Our pivot point is at 67.5. Our preference: short term rebound towards 80. Alternative scenario: below 67.5, expect 63.8 and 61.7. Comment: the RSI is below its neutrality area at 50. The MACD is above its signal line and negative. The configuration is mixed. Moreover, the share stands below its 20 and 50 day MA (respectively at 73.26 and 77.35). Our pivot point is at 30.7. Our preference: short term rebound towards 36.9. Alternative scenario: below 30.7, expect 28.6 and 27.3. Comment: the RSI is below its neutrality area at 50. The MACD is negative and above its signal line. The configuration is mixed. Moreover, the share stands above its 20 day MA (32.59) but below its 50 day MA (34.48). American Express Intraday: the downside prevails. Our preference: short positions below 56 with targets @ 52.25 & 49.5 in extension. Alternative scenario: above 56 look for further upside with 59.75 & 61 as targets. Affiliated Managers Group Intraday: under pressure. Our preference: short positions below 132.25 with targets @ 121 & 113.2 in extension. Alternative scenario: above 132.25 look for further upside with 137 & 141 as targets. Our pivot point is at 12.2. Our preference: short term rebound towards 14. Alternative scenario: below 12.2, expect 11.6 and 11.2. Comment: the RSI is below 50. The MACD is negative and above its signal line. The configuration is mixed. Moreover, the share stands below its 20 and 50 day MA (respectively at 13.01 and 14.04). Our pivot point is at 53.3. Alternative scenario: the downside breakout of 53.3 would call for 49.5 and 47.1. Comment: the RSI is above its neutrality area at 50. The MACD is above its signal line and negative. The MACD must break above its zero level to trigger further gains. Moreover, the stock is trading above its 20 day MA (55.75) but under its 50 day MA (60.41). Our pivot point stands at 293.2. Our preference: the downside prevails as long as 293.2 is resistance. Alternative scenario: the upside breakout of 293.2 would call for 303.8 and 310.3. Comment: the RSI is below 50. The MACD is below its signal line and negative. The configuration is negative. Moreover, the share stands below its 20 and 50 day MA (respectively at 293.98 and 304.11). Our pivot point is at 43.2. Alternative scenario: below 43.2, expect 41.1 and 39.9. Comment: the RSI is above 50. The MACD is negative and above its signal line. The MACD must break above its zero level to call for further upside. Moreover, the stock is trading above its 20 day MA (44.15) but under its 50 day MA (46.42). Alphabet Intraday: bullish bias above 736. Our preference: long positions above 736 with targets @ 777 & 811 in extension. Alternative scenario: below 736 look for further downside with 714 & 687 as targets. Apple Intraday: bullish bias above 94. Our preference: long positions above 94 with targets @ 98 & 100 in extension. Alternative scenario: below 94 look for further downside with 92.4 & 90 as targets. Our pivot point is at 10.7. Our preference: short term rebound towards 12.2. Alternative scenario: the downside breakout of 10.7 would call for 10.2 and 9.9. Comment: the RSI is below 50. The MACD is negative and above its signal line. The configuration is mixed. Moreover, the stock is trading under both its 20 and 50 day MA (respectively at 11.31 and 11.89). iShares MSCI Japan is currently trading near its 52 week low at 10.64 reached on 21/01/16. Our pivot point stands at 28.3. Alternative scenario: the downside breakout of 28.3 would call for 27 and 26.2. Comment: the RSI is above 50. The MACD is negative and above its signal line. The MACD must break above its zero level to trigger further gains. Moreover, the share stands below its 20 and 50 day MA (respectively at 29.38 and 31.62). Our pivot point is at 36.2. Our preference: short term rebound towards 44.9. Alternative scenario: the downside breakout of 36.2 would call for 33.6 and 32. Comment: the RSI is below 50. The MACD is above its signal line and negative. The configuration is mixed. Moreover, the share stands below its 20 and 50 day MA (respectively at 41.4 and 43.09). Our pivot point stands at 291.1. Our preference: the downside prevails as long as 291.1 is resistance. Alternative scenario: the upside breakout of 291.1 would call for 301.6 and 307.8. Comment: the RSI is below 50. The MACD is negative and below its signal line. The configuration is negative. Moreover, the stock is trading under both its 20 and 50 day MA (respectively at 292.46 and 303.63). Our pivot point stands at 11.8. Our preference: the downside prevails as long as 11.8 is resistance. Alternative scenario: above 11.8, look for 12.5 and 13. Comment: the RSI is trading below 30. This could mean that either the stock is in a lasting downtrend or just oversold and that therefore a rebound could shape (look for bullish divergence in this case). The MACD is below its signal line and negative. The configuration is negative. Moreover, the stock is trading under both its 20 and 50 day MA (respectively at 12.76 and 15.11). China Life (ADR) is currently trading near its 52 week low at 11.1 reached on 03/02/16. Alternative scenario: above 21.9, look for 23.1 and 23.8. Comment: the RSI is below 30. It could either mean that the stock is in a lasting downtrend or just oversold and therefore bound to retrace (look for bullish divergence in this case). The MACD is negative and below its signal line. The configuration is negative. Moreover, the stock is trading under both its 20 and 50 day MA (respectively at 22.29 and 24.1). VF Corp Intraday: end of the consolidation. Our preference: long positions above 58.3 with targets @ 64.5 & 67.8 in extension. Alternative scenario: below 58.3 look for further downside with 55.7 & 54.1 as targets. Our preference: long positions above 131.35 with targets @ 142.8 & 149.75 in extension. Alternative scenario: below 131.35 look for further downside with 125.85 & 123.5 as targets. 62.3 is our pivot point. Alternative scenario: below 62.3, expect 59.8 and 58.4. Comment: the RSI is above 50. The MACD is negative and above its signal line. The MACD must break above its zero level to trigger further gains. Moreover, the share stands above its 20 day MA (63.58) but below its 50 day MA (67.12). Our pivot point is at 108.5. Our preference: the upside prevails as long as 108.5 is support. Alternative scenario: the downside breakout of 108.5 would call for 107.7 and 107. Comment: the RSI is above 70. It could mean either that the stock is in a lasting uptrend or just overbought and therefore bound to correct (look for bearish divergence in this case). The MACD is positive and above its signal line. The configuration is positive. Moreover, the stock is above its 20 and 50 day MA (respectively at 108.16 and 106.93). iShares Barclays 7-10 Year Treasury Bond is currently trading near its 52 week low at 103.76 reached on 10/06/15. Our pivot point is at 111.4. Our preference: the downside prevails as long as 111.4 is resistance. Alternative scenario: the upside breakout of 111.4 would call for 121.1 and 127. Comment: the RSI is below its neutrality area at 50. The MACD is below its signal line and negative. The configuration is negative. Moreover, the share stands below its 20 and 50 day MA (respectively at 103.82 and 109.79). Our pivot point is at 285. Our preference: the downside prevails as long as 285 is resistance. Alternative scenario: the upside breakout of 285 would call for 295.2 and 301.3. Comment: the RSI is below 30. It could either mean that the stock is in a lasting downtrend or just oversold and therefore bound to retrace (look for bullish divergence in this case). The MACD is negative and below its signal line. The configuration is negative. Moreover, the share stands below its 20 and 50 day MA (respectively at 290.91 and 302.83). Finally, Allergan is trading below its lower daily Bollinger band (standing at 274.02). 8.83 is our pivot point. Our preference: short term rebound towards 11.1. Alternative scenario: the downside breakout of 8.83 would call for 8.12 and 7.71. Comment: the RSI is below 50. The MACD is above its signal line and negative. The configuration is mixed. Moreover, the stock is trading above its 20 day MA (9.53) but under its 50 day MA (10.07). Our pivot point is at 1.28. Alternative scenario: the downside breakout of 1.28 would call for 1.06 and 0.94. Comment: the RSI is below 50. The MACD is negative and above its signal line. The configuration is mixed. Moreover, the share stands above its 20 day MA (1.5) but below its 50 day MA (1.58). Microsoft Intraday: bullish bias above 49.25. Our preference: long positions above 49.25 with targets @ 52 & 53.4 in extension. Alternative scenario: below 49.25 look for further downside with 48.1 & 47.05 as targets. Apple Intraday: bullish bias above 93.60. Our preference: long positions above 93.60 with targets @ 98 & 100 in extension. Alternative scenario: below 93.60 look for further downside with 92.4 & 90 as targets. 225.3 is our pivot point. Alternative scenario: the downside breakout of 225.3 would call for 216.3 and 210.9. Comment: the RSI is above its neutrality area at 50. The MACD is negative and above its signal line. The MACD must break above its zero level to call for further upside. Moreover, the share stands below its 20 and 50 day MA (respectively at 234.04 and 247.99). Our pivot point is at 52.3. Alternative scenario: the downside breakout of 52.3 would call for 48.2 and 45.8. Comment: the RSI is above its neutrality area at 50. The MACD is negative and above its signal line. The MACD must break above its zero level to trigger further gains. Moreover, the stock is trading above its 20 day MA (55.25) but under its 50 day MA (59.52). Our pivot point is at 285.7. Our preference: the downside prevails as long as 285.7 is resistance. Alternative scenario: above 285.7, look for 296 and 302.1. Comment: the RSI is below 30. It could either mean that the stock is in a lasting downtrend or just oversold and therefore bound to retrace (look for bullish divergence in this case). The MACD is negative and below its signal line. The configuration is negative. Moreover, the share stands below its 20 and 50 day MA (respectively at 289.44 and 302.27). Our pivot point stands at 120. Our preference: the upside prevails as long as 120 is support. Alternative scenario: below 120, expect 114.3 and 110.8. Comment: the RSI is above its neutrality area at 50. The MACD is positive and above its signal line. The configuration is positive. Moreover, the stock is trading above both its 20 and 50 day MA (respectively at 122.37 and 124.39). Raytheon is currently trading near its 52 week high reached at 129.99 on 17/12/15. Our pivot point stands at 3.66. Alternative scenario: the downside breakout of 3.66 would call for 2.84 and 2.36. Comment: the RSI is above 50. The MACD is above its signal line and negative. The MACD must break above its zero level to call for further upside. Moreover, the stock is trading above its 20 day MA (4.05) but under its 50 day MA (5). Our pivot point stands at 3.34. Our preference: the upside prevails as long as 3.34 is support. Alternative scenario: below 3.34, expect 2.99 and 2.78. Comment: the RSI is above 50. The MACD is positive and above its signal line. The configuration is positive. Moreover, the stock is above its 20 and 50 day MA (respectively at 3.51 and 3.47). 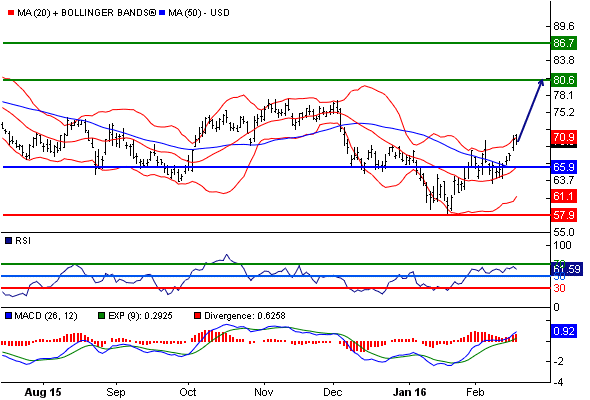 Target Intraday: key resistance at 70.80. Our preference: short positions below 70.80 with targets @ 68.20 & 67.50 in extension. Alternative scenario: above 70.80 look for further upside with 71.60 & 72.80 as targets. Our preference: short positions below 91.45 with targets @ 79.60 & 75.30 in extension. Alternative scenario: above 91.45 look for further upside with 97.30 & 102.25 as targets. Our pivot point is at 23.8. Alternative scenario: the downside breakout of 23.8 would call for 21.9 and 20.8. Comment: the RSI is above its neutrality area at 50. The MACD is above its signal line and negative. The MACD must break above its zero level to call for further upside. Moreover, the stock is trading above its 20 day MA (25.38) but under its 50 day MA (27.59). Our pivot point is at 16.3. Alternative scenario: the downside breakout of 16.3 would call for 15.3 and 14.8. Comment: the RSI is above its neutrality area at 50. The MACD is negative and above its signal line. The MACD must break above its zero level to trigger further gains. Moreover, the share stands above its 20 day MA (17.11) but below its 50 day MA (18.02). Our pivot point is at 281.1. Our preference: the downside prevails as long as 281.1 is resistance. Alternative scenario: above 281.1, look for 292 and 298.6. Comment: the RSI is below 30. It could either mean that the stock is in a lasting downtrend or just oversold and therefore bound to retrace (look for bullish divergence in this case). The MACD is negative and below its signal line. The configuration is negative. Moreover, the stock is trading under both its 20 and 50 day MA (respectively at 287.79 and 301.37). Finally, Allergan is trading below its lower daily Bollinger band (standing at 268.13). 70.3 is our pivot point. Alternative scenario: the downside breakout of 70.3 would call for 66.3 and 63.9. Comment: the RSI is above 50. The MACD is above its signal line and negative. The MACD must break above its zero level to trigger further gains. Moreover, the stock is trading above its 20 day MA (72.84) but under its 50 day MA (76.14). 29 is our pivot point. Our preference: short term rebound towards 35.3. Alternative scenario: the downside breakout of 29 would call for 26.7 and 25.3. Comment: the RSI is below its neutrality area at 50. The MACD is above its signal line and negative. The configuration is mixed. Moreover, the stock is trading under both its 20 and 50 day MA (respectively at 32.08 and 33.74). Huaneng Power (ADR) is currently trading near its 52 week low at 30.08 reached on 20/01/16. Citigroup Intraday: the downside prevails. Our preference: short positions below 38.50 with targets @ 34.80 & 34.30 in extension. Alternative scenario: above 38.50 look for further upside with 39.15 & 39.85 as targets. Microsoft Intraday: key resistance at 50.30. Our preference: short positions below 50.30 with targets @ 48.10 & 47.05 in extension. Alternative scenario: above 50.30 look for further upside with 52.00 & 53.40 as targets. Our pivot point is at 12.1. Alternative scenario: below 12.1, expect 11.4 and 11. Comment: the RSI is above its neutrality area at 50. The MACD is negative and above its signal line. The MACD must break above its zero level to call for further upside. Moreover, the share stands below its 20 and 50 day MA (respectively at 12.88 and 13.76). iShares S&P GSCI Commodity-Indexed Trust is currently trading near its 52 week low at 12.03 reached on 20/01/16. 95.8 is our pivot point. Our preference: the downside prevails as long as 95.8 is resistance. Alternative scenario: above 95.8, look for 99.4 and 101.5. Comment: the RSI is below 50. The MACD is below its signal line and negative. The configuration is negative. Moreover, the stock is trading under both its 20 and 50 day MA (respectively at 94.93 and 96.75). Finally, iShares Cohen & Steers Realty Majors is trading below its lower daily Bollinger band (standing at 91.7). Cisco Systems ST: under pressure. 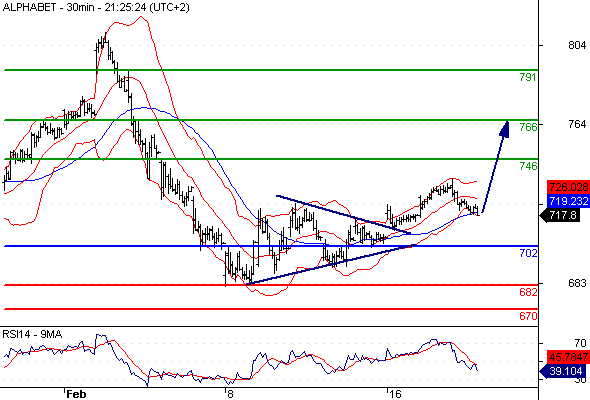 Our preference: short positions below 25.00 with targets @ 22.00 & 21.20 in extension. Alternative scenario: above 25.00 look for further upside with 26.65 & 27.85 as targets. Our preference: long positions above 89.00 with targets @ 117.60 & 125.00 in extension. Alternative scenario: below 89.00 look for further downside with 82.00 & 76.45 as targets. Our pivot point stands at 4. Our preference: as long as 4 is resistance look for 2.49. Alternative scenario: above 4, look for 4.45 and 4.71. Comment: the RSI is below its neutrality area at 50. The MACD is above its signal line and positive. The break above the 50 area on the RSI would call for further upside. Moreover, the stock is trading under both its 20 and 50 day MA (respectively at 3.48 and 3.47). Our preference: long positions above 683.00 with targets @ 732.00 & 746.00 in extension. Alternative scenario: below 683.00 look for further downside with 670.00 & 657.00 as targets. Apple Intraday: bullish bias above 93.00. Our preference: long positions above 93.00 with targets @ 97.50 & 99.00 in extension. Alternative scenario: below 93.00 look for further downside with 92.00 & 90.00 as targets. Our pivot point is at 50.5. Alternative scenario: the downside breakout of 50.5 would call for 46.8 and 44.6. Comment: the RSI is above 50. The MACD is negative and above its signal line. The MACD must break above its zero level to call for further upside. Moreover, the stock is trading under both its 20 and 50 day MA (respectively at 55.2 and 58.98). Our pivot point is at 19.4. Our preference: short term rebound towards 22. Alternative scenario: below 19.4, expect 18.6 and 18.1. Comment: the RSI is below its neutrality area at 50. The MACD is negative and above its signal line. The configuration is mixed. Moreover, the share stands below its 20 and 50 day MA (respectively at 21.23 and 22.79). Our pivot point is at 291.9. Our preference: the downside prevails as long as 291.9 is resistance. Alternative scenario: above 291.9, look for 304.3 and 311.7. Comment: the RSI is below its neutrality area at 50. The MACD is below its signal line and negative. The configuration is negative. Moreover, the stock is trading under both its 20 and 50 day MA (respectively at 285.62 and 299.61). Our pivot point stands at 73.1. Our preference: our next up target stands at 86.3. Alternative scenario: below 73.1, expect 68.9 and 66.4. Comment: the RSI is above its neutrality area at 50. The MACD is negative and above its signal line. The MACD must break above its zero level to call for further upside. Moreover, the stock is above its 20 and 50 day MA (respectively at 72.99 and 75.84). News Corp Intraday: under pressure. Our preference: short positions below 10.80 with targets @ 9.90 & 9.50 in extension. Alternative scenario: above 10.80 look for further upside with 11.25 & 11.80 as targets. Twenty-First Century Fox Intraday: the downside prevails. Our preference: short positions below 25.50 with targets @ 22.75 & 21.45 in extension. Alternative scenario: above 25.50 look for further upside with 26.00 & 26.95 as targets. Our preference: the downside prevails as long as 11.1 is resistance. Alternative scenario: above 11.1, look for 11.6 and 11.9. Comment: the RSI is below 50. The MACD is below its signal line and negative. The configuration is negative. Moreover, the stock is trading under both its 20 and 50 day MA (respectively at 11.13 and 11.72). Finally, iShares MSCI Japan has penetrated its lower daily Bollinger band (10.6). iShares MSCI Japan is currently trading near its 52 week low at 10.5 reached on 10/02/16. Our pivot point is at 19.1. Alternative scenario: below 19.1, expect 18 and 17.4. Comment: the RSI is above its neutrality area at 50. The MACD is above its signal line and negative. The MACD must break above its zero level to trigger further gains. Moreover, the share stands below its 20 and 50 day MA (respectively at 20.04 and 21.04). Our pivot point stands at 39.8. Our preference: the downside prevails as long as 39.8 is resistance. Alternative scenario: the upside breakout of 39.8 would call for 42.5 and 44.1. 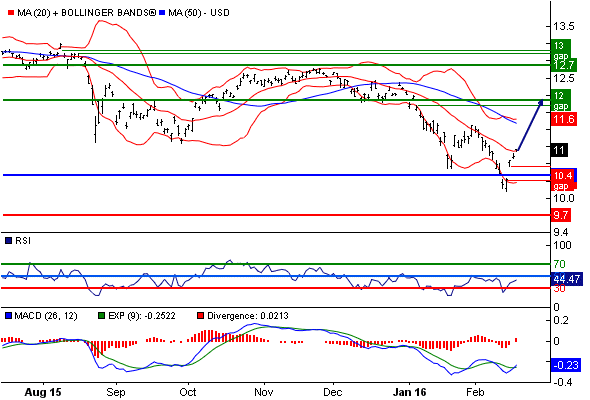 Comment: the RSI is below its neutrality area at 50. The MACD is below its signal line and negative. The configuration is negative. Moreover, the stock is trading under both its 20 and 50 day MA (respectively at 40.09 and 42.31). Our pivot point stands at 78.1. Our preference: the downside prevails as long as 78.1 is resistance. Alternative scenario: above 78.1, look for 82 and 84.1. Comment: the RSI is below its neutrality area at 50. The MACD is below its signal line and negative. The configuration is negative. Moreover, the stock is trading under both its 20 and 50 day MA (respectively at 78.09 and 81.28). Walgreens Boots Alliance is currently trading near its 52 week low at 71.5 reached on 08/02/16. Our pivot point is at 9.76. Our preference: the downside prevails as long as 9.76 is resistance. Alternative scenario: the upside breakout of 9.76 would call for 10.49 and 10.93. Comment: the RSI is below 50. The MACD is below its signal line and negative. The configuration is negative. Moreover, the stock is trading under both its 20 and 50 day MA (respectively at 9.22 and 10.04). AT&T Intraday: the upside prevails. Our preference: long positions above 35.45 with targets @ 37.10 & 37.60 in extension. Alternative scenario: below 35.45 look for further downside with 35.00 & 34.45 as targets. Verizon Communications Intraday: end of the consolidation. Our preference: long positions above 49.00 with targets @ 51.10 & 52.10 in extension. Alternative scenario: below 49.00 look for further downside with 47.75 & 46.60 as targets. Our pivot point stands at 23.8. Alternative scenario: below 23.8, expect 22 and 20.9. Comment: the RSI is above its neutrality area at 50. The MACD is above its signal line and negative. The MACD must break above its zero level to trigger further gains. Moreover, the share stands above its 20 day MA (25.4) but below its 50 day MA (27.06). Our pivot point is at 15.9. Our preference: short term rebound towards 18.6. Alternative scenario: below 15.9, expect 14.9 and 14.4. Comment: the RSI is below 50. The MACD is above its signal line and negative. The configuration is negative. Moreover, the share stands below its 20 and 50 day MA (respectively at 17.07 and 17.83). iShares MSCI Australia is currently trading near its 52 week low at 16.08 reached on 20/01/16. Our pivot point stands at 8.56. Our preference: short term rebound towards 10.54. Alternative scenario: below 8.56, expect 7.97 and 7.62. Comment: the RSI is below 50. The MACD is above its signal line and negative. The configuration is mixed. Moreover, the share stands below its 20 and 50 day MA (respectively at 9.63 and 10.85). HP is currently trading near its 52 week low at 8.91 reached on 11/02/16. 27 is our pivot point. Our preference: short term rebound towards 33.7. Alternative scenario: the downside breakout of 27 would call for 24.8 and 23.5. Comment: the RSI is below its neutrality area at 50. The MACD is negative and above its signal line. The configuration is mixed. Moreover, the stock is trading under both its 20 and 50 day MA (respectively at 30.2 and 33). Halliburton is currently trading near its 52 week low at 27.64 reached on 20/01/16. 31.8 is our pivot point. Our preference: the downside prevails as long as 31.8 is resistance. Alternative scenario: above 31.8, look for 34.2 and 35.6. Comment: the RSI is below 50. The MACD is below its signal line and negative. The configuration is negative. Moreover, the share stands below its 20 and 50 day MA (respectively at 31.38 and 33.21). Huaneng Power (ADR) is currently trading near its 52 week low at 29.27 reached on 11/02/16. Our pivot point stands at 4.52. Our preference: the downside prevails as long as 4.52 is resistance. Alternative scenario: the upside breakout of 4.52 would call for 5.27 and 5.71. Comment: the RSI is below 50. The MACD is negative and below its signal line. The configuration is negative. Moreover, the share stands below its 20 and 50 day MA (respectively at 4.11 and 4.71). NextEra Energy Intraday: end of the consolidation. Our preference: long positions above 110.00 with targets @ 116.00 & 118.60 in extension. Alternative scenario: below 110.00 look for further downside with 107.90 & 106.00 as targets. CMS Energy Intraday: end of the consolidation. Our preference: long positions above 38.00 with targets @ 40.30 & 41.70 in extension. Alternative scenario: below 38.00 look for further downside with 37.20 & 36.60 as targets. Our pivot point stands at 95.6. Our preference: short term rebound towards 107.7. Alternative scenario: below 95.6, expect 91.7 and 89.3. Comment: the RSI is below 50. The MACD is negative and above its signal line. The configuration is mixed. Moreover, the share stands above its 20 day MA (99.81) but below its 50 day MA (105.2). Our pivot point stands at 87.1. Alternative scenario: below 87.1, expect 83.5 and 81.4. Comment: the RSI is above 50. The MACD is negative and above its signal line. The MACD must break above its zero level to trigger further gains. Moreover, the stock is trading above its 20 day MA (90.05) but under its 50 day MA (94.02). iShares Russell 1000 Value is currently trading near its 52 week low at 86.15 reached on 20/01/16. Our pivot point is at 42.4. Our preference: short term rebound towards 53.9. Alternative scenario: the downside breakout of 42.4 would call for 38.6 and 36.3. Comment: the RSI is below 50. The MACD is negative and above its signal line. The configuration is mixed. Moreover, the stock is trading above its 20 day MA (45.41) but under its 50 day MA (47.31). Our pivot point is at 69.3. Alternative scenario: the downside breakout of 69.3 would call for 65.2 and 62.7. Comment: the RSI is above 50. The MACD is above its signal line and negative. The MACD must break above its zero level to call for further upside. Moreover, the stock is trading above its 20 day MA (70.28) but under its 50 day MA (78.48). Our pivot point is at 3.6. Our preference: as long as 3.6 is resistance look for 2.49. Alternative scenario: above 3.6, look for 3.98 and 4.21. Comment: the RSI is above 50. The MACD is negative and below its signal line. The penetration of 50 on the RSI should trigger further losses. Moreover, the share stands below its 20 and 50 day MA (respectively at 3.39 and 3.44). Suntrust Banks Intraday: turning down. Our preference: short positions below 35.40 with targets @ 32.90 & 31.90 in extension. Alternative scenario: above 35.40 look for further upside with 36.55 & 36.90 as targets. Our preference: long positions above 702.00 with targets @ 746.00 & 766.00 in extension. Alternative scenario: below 702.00 look for further downside with 682.00 & 670.00 as targets. 51.9 is our pivot point. Alternative scenario: the downside breakout of 51.9 would call for 47.9 and 45.4. Comment: the RSI is above 50. The MACD is negative and above its signal line. The MACD must break above its zero level to trigger further gains. Moreover, the share stands above its 20 day MA (55.21) but below its 50 day MA (57.94). Our pivot point stands at 19.8. Our preference: short term rebound towards 22.7. Alternative scenario: the downside breakout of 19.8 would call for 18.9 and 18.3. 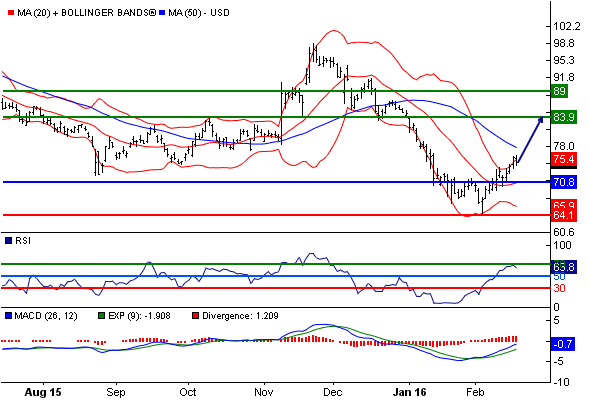 Comment: the RSI is below its neutrality area at 50. The MACD is above its signal line and negative. The configuration is mixed. Moreover, the stock is trading under both its 20 and 50 day MA (respectively at 20.93 and 22.45). Our pivot point stands at 68.5. Our preference: the downside prevails as long as 68.5 is resistance. Alternative scenario: above 68.5, look for 72.8 and 75.4. Comment: the RSI is below its neutrality area at 50. The MACD is below its signal line and negative. The configuration is negative. Moreover, the stock is trading under both its 20 and 50 day MA (respectively at 68.02 and 67.43). Our pivot point stands at 70.4. Alternative scenario: below 70.4, expect 66.2 and 63.7. Comment: the RSI is above 50. The MACD is negative and above its signal line. The MACD must break above its zero level to call for further upside. Moreover, the stock is trading above its 20 day MA (70.48) but under its 50 day MA (78.13). Finally, Norfolk Southern is trading above its upper Bollinger band (standing at 74.94). Our preference: short positions below 37.00 with targets @ 35.45 & 35.00 in extension. Alternative scenario: above 37.00 look for further upside with 37.60 & 39.00 as targets. Our pivot point stands at 10.5. Our preference: short term rebound towards 12. Alternative scenario: the downside breakout of 10.5 would call for 10 and 9.7. Comment: the RSI is below its neutrality area at 50. The MACD is above its signal line and negative. The configuration is mixed. Moreover, the stock is trading above its 20 day MA (10.99) but under its 50 day MA (11.54). Our pivot point stands at 20.5. Our preference: the upside prevails as long as 20.5 is support. Alternative scenario: below 20.5, expect 19.2 and 18.5. Comment: the RSI is above its neutrality area at 50. The MACD is positive and above its signal line. The configuration is positive. Moreover, the stock is above its 20 and 50 day MA (respectively at 20.47 and 20.79). Our pivot point stands at 65.9. Our preference: the upside prevails as long as 65.9 is support. Alternative scenario: below 65.9, expect 60.9 and 57.9. Comment: the RSI is above 50. The MACD is positive and above its signal line. The configuration is positive. Moreover, the stock is trading above both its 20 and 50 day MA (respectively at 66.02 and 65.95). Our pivot point stands at 70.8. Alternative scenario: the downside breakout of 70.8 would call for 66.6 and 64.1. Comment: the RSI is above its neutrality area at 50. The MACD is negative and above its signal line. The MACD must break above its zero level to trigger further gains. Moreover, the share stands above its 20 day MA (70.66) but below its 50 day MA (77.78). Our pivot point stands at 3.17. Our preference: our next up target stands at 4.44. Alternative scenario: below 3.17, expect 2.75 and 2.5. Comment: the RSI is above 50. The MACD is above its signal line and negative. The MACD must break above its zero level to call for further upside. Moreover, the stock is above its 20 and 50 day MA (respectively at 3.41 and 3.45). Our pivot point stands at 8.92. Alternative scenario: the downside breakout of 8.92 would call for 8.02 and 7.48. Comment: the RSI is above 50. The MACD is above its signal line and negative. The MACD must break above its zero level to call for further upside. Moreover, the stock is trading above its 20 day MA (9.23) but under its 50 day MA (9.97). Endo International Intraday: the downside prevails. 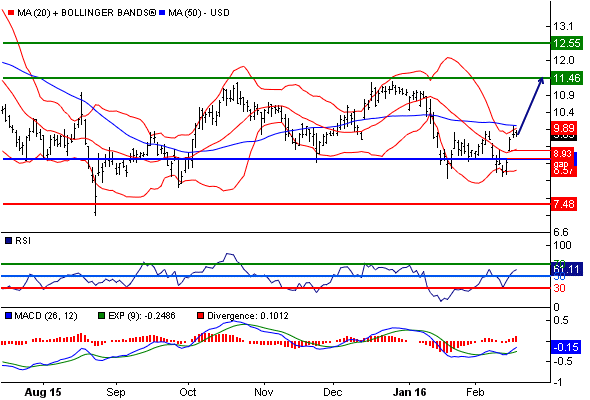 Our preference: short positions below 54.00 with targets @ 46.80 & 43.00 in extension. Alternative scenario: above 54.00 look for further upside with 56.50 & 58.30 as targets. Eli Lilly Intraday: the downside prevails. Our preference: short positions below 75.00 with targets @ 68.75 & 66.50 in extension. Alternative scenario: above 75.00 look for further upside with 77.80 & 79.50 as targets. 28.8 is our pivot point. Our preference: short term rebound towards 33.2. Alternative scenario: the downside breakout of 28.8 would call for 27.2 and 26.3. Comment: the RSI is below its neutrality area at 50. The MACD is negative and above its signal line. The configuration is mixed. Moreover, the stock is trading above its 20 day MA (29.71) but under its 50 day MA (30.66). Our pivot point is at 44.9. Our preference: short term rebound towards 50.8. Alternative scenario: below 44.9, expect 42.7 and 41.4. Comment: the RSI is below its neutrality area at 50. The MACD is above its signal line and negative. The configuration is mixed. Moreover, the share stands below its 20 and 50 day MA (respectively at 47.03 and 48.27). Our pivot point is at 74.7. Alternative scenario: below 74.7, expect 70.6 and 68.2. Comment: the RSI is trading above 70. This could mean that either the stock is in a lasting uptrend or just overbought and that therefore a correction could shape (look for bearish divergence in this case). The MACD is positive and above its signal line. The configuration is positive. Moreover, the stock is above its 20 and 50 day MA (respectively at 74.42 and 75.55). Our pivot point stands at 68.6. Our preference: the downside prevails as long as 68.6 is resistance. Alternative scenario: above 68.6, look for 72.9 and 75.5. Comment: the RSI is below 50. The MACD is negative and below its signal line. The configuration is negative. Moreover, the stock is trading under both its 20 and 50 day MA (respectively at 67.57 and 67.2). Our pivot point stands at 3.64. Our preference: short term rebound towards 6.19. Alternative scenario: the downside breakout of 3.64 would call for 2.77 and 2.26. Comment: the RSI is below its neutrality area at 50. The MACD is above its signal line and negative. The configuration is mixed. Moreover, the stock is trading above its 20 day MA (4.28) but under its 50 day MA (4.52). 1.35 is our pivot point. Our preference: short term rebound towards 1.77. Alternative scenario: the downside breakout of 1.35 would call for 1.2 and 1.11. Comment: the RSI is below its neutrality area at 50. The MACD is negative and above its signal line. The configuration is mixed. Moreover, the stock is trading above its 20 day MA (1.48) but under its 50 day MA (1.55). Plum Creek Timber Intraday: under pressure. Our preference: short positions below 37.65 with targets @ 35.25 & 33.50 in extension. Alternative scenario: above 37.65 look for further upside with 39.00 & 39.40 as targets. 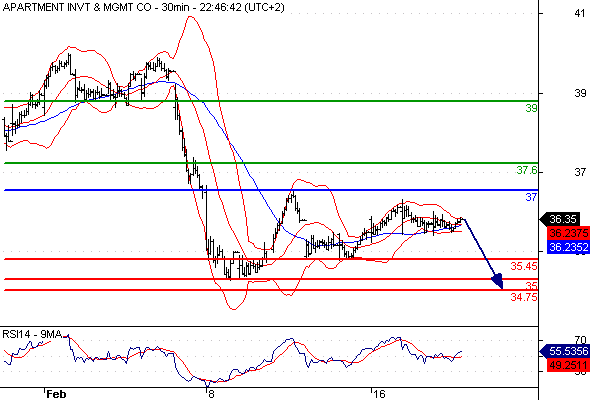 Our preference: short positions below 312.00 with targets @ 276.00 & 265.00 in extension. Alternative scenario: above 312.00 look for further upside with 318.00 & 330.00 as targets. Our pivot point is at 25.3. Our preference: the upside prevails as long as 25.3 is support. Alternative scenario: the downside breakout of 25.3 would call for 23.4 and 22.2. Comment: the RSI is above 50. The MACD is above its signal line and positive. The configuration is positive. Moreover, the stock is above its 20 and 50 day MA (respectively at 25.92 and 26.7). Our pivot point is at 17.2. Our preference: the upside prevails as long as 17.2 is support. Alternative scenario: the downside breakout of 17.2 would call for 16.2 and 15.6. Comment: the RSI is above 50. The MACD is positive and above its signal line. The configuration is positive. Moreover, the stock is above its 20 and 50 day MA (respectively at 17.3 and 17.68). Finally, iShares MSCI Australia has crossed above its upper daily Bollinger band (18.04). Our pivot point is at 77.3. Our preference: the upside prevails as long as 77.3 is support. Alternative scenario: the downside breakout of 77.3 would call for 73 and 70.5. Comment: the RSI is above 70. It could mean either that the stock is in a lasting uptrend or just overbought and therefore bound to correct (look for bearish divergence in this case). The MACD is positive and above its signal line. The configuration is positive. Moreover, the stock is trading above both its 20 and 50 day MA (respectively at 75 and 75.67). 69.8 is our pivot point. Our preference: the downside prevails as long as 69.8 is resistance. Alternative scenario: the upside breakout of 69.8 would call for 74 and 76.6. Comment: the RSI is below its neutrality area at 50. The MACD is below its signal line and negative. The configuration is negative. Moreover, the share stands below its 20 and 50 day MA (respectively at 67.31 and 67.14). Perrigo Intraday: the downside prevails. Our preference: short positions below 127.45 with targets @ 118.10 & 114.50 in extension. Alternative scenario: above 127.45 look for further upside with 130.35 & 133.50 as targets. Comment: as long as 127.45 is resistance, expect a return to 118.10. Mylan Intraday: technical rebound in a bearish trend. Our preference: short positions below 48.75 with targets @ 43.80 & 41.85 in extension. Alternative scenario: above 48.75 look for further upside with 51.50 & 53.20 as targets. Our preference: short term rebound towards 14.3. Alternative scenario: below 12.2, expect 11.5 and 11.1. Comment: the RSI is below its neutrality area at 50. The MACD is above its signal line and negative. The configuration is mixed. Moreover, the stock is trading under both its 20 and 50 day MA (respectively at 12.9 and 13.32). Our pivot point stands at 99.1. Alternative scenario: the downside breakout of 99.1 would call for 95.1 and 92.6. Comment: the RSI is above 50. The MACD is negative and above its signal line. The MACD must break above its zero level to call for further upside. Moreover, the stock is trading above its 20 day MA (100.53) but under its 50 day MA (104.07). 75.5 is our pivot point. Our preference: the upside prevails as long as 75.5 is support. Alternative scenario: the downside breakout of 75.5 would call for 71.3 and 68.8. Comment: the RSI is above 50. The MACD is positive and above its signal line. The configuration is positive. Moreover, the stock is trading above both its 20 and 50 day MA (respectively at 75.51 and 75.7). Our pivot point stands at 70.7. Our preference: the downside prevails as long as 70.7 is resistance. Alternative scenario: the upside breakout of 70.7 would call for 75 and 77.5. Comment: the RSI is below 50. The MACD is below its signal line and negative. The configuration is negative. Moreover, the share stands below its 20 and 50 day MA (respectively at 67.13 and 67.1). 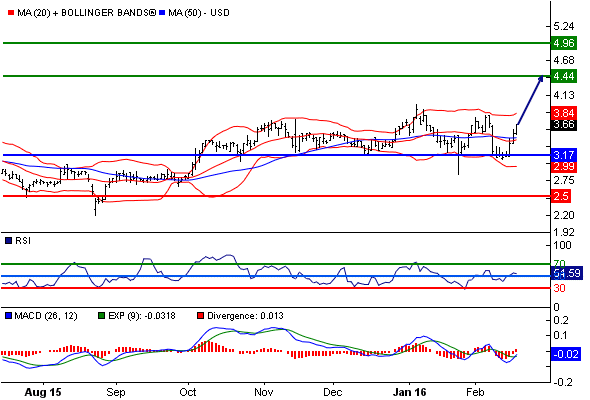 Sandisk Intraday: look for 61.05. Our preference: short positions below 72.00 with targets @ 63.55 & 61.05 in extension. Alternative scenario: above 72.00 look for further upside with 74.85 & 76.70 as targets. Comment: the upward potential is likely to be limited by the resistance at 72.00. Harris Corp Intraday: the downside prevails. Our preference: short positions below 77.00 with targets @ 71.05 & 70.50 in extension. Alternative scenario: above 77.00 look for further upside with 79.75 & 81.50 as targets. 53.1 is our pivot point. Alternative scenario: the downside breakout of 53.1 would call for 49.1 and 46.7. Comment: the RSI is above its neutrality area at 50. The MACD is negative and above its signal line. The MACD must break above its zero level to call for further upside. Moreover, the share stands above its 20 day MA (56.14) but below its 50 day MA(57.34). Our pivot point stands at 20.1. Our preference: short term rebound towards 23. Alternative scenario: below 20.1, expect 19.1 and 18.5. Comment: the RSI is below 50. The MACD is negative and above its signal line. The configuration is mixed. Moreover, the share stands above its 20 day MA (20.92) but below its 50 day MA (22.12). Our pivot point is at 208.4. Our preference: the upside prevails as long as 208.4 is support. Alternative scenario: the downside breakout of 208.4 would call for 201.8 and 197.7. Comment: the RSI is above 50. The MACD is positive and above its signal line. The configuration is positive. Moreover, the stock is above its 20 and 50 day MA (respectively at 211.75 and 213.97). Lockheed Martin is currently trading near its 52 week high reached at 227.91 on 25/11/15. 128.5 is our pivot point. Our preference: the upside prevails as long as 128.5 is support. Alternative scenario: the downside breakout of 128.5 would call for 122.9 and 119.7. Comment: the RSI is above its neutrality area at 50. The MACD is above its signal line and positive. The configuration is positive. Moreover, the stock is above its 20 and 50 day MA (respectively at 133.13 and 133.55). Republic Services Intraday: further advance. Our preference: long positions above 45.30 with targets @ 47.30 & 48.50 in extension. Alternative scenario: below 45.30 look for further downside with 44.75 & 43.60 as targets. Our preference: long positions above 47.80 with targets @ 51.10 & 52.70 in extension. Alternative scenario: below 47.80 look for further downside with 47.05 & 46.40 as targets. 10.5 is our pivot point. Alternative scenario: below 10.5, expect 10 and 9.7. Comment: the RSI is below its neutrality area at 50. The MACD is negative and above its signal line. The configuration is mixed. Moreover, the share stands above its 20 day MA (10.94) but below its 50 day MA (11.42). Our pivot point is at 20.3. Our preference: the upside prevails as long as 20.3 is support. Alternative scenario: the downside breakout of 20.3 would call for 19.1 and 18.4. Comment: the RSI is above 50. The MACD is above its signal line and positive. The configuration is positive. Moreover, the stock is trading above both its 20 and 50 day MA (respectively at 20.86 and 20.72). 75.2 is our pivot point. Our preference: the upside prevails as long as 75.2 is support. Alternative scenario: below 75.2, expect 71.1 and 68.6. Comment: the RSI is above its neutrality area at 50. The MACD is above its signal line and positive. The configuration is positive. Moreover, the stock is trading above both its 20 and 50 day MA (respectively at 76.52 and 75.79). 64.6 is our pivot point. Our preference: the upside prevails as long as 64.6 is support. Alternative scenario: the downside breakout of 64.6 would call for 59.8 and 56.9. Comment: the RSI is above its neutrality area at 50. The MACD is positive and above its signal line. The configuration is positive. Moreover, the stock is trading above both its 20 and 50 day MA (respectively at 67.81 and 66.14). 3.47 is our pivot point. Our preference: the upside prevails as long as 3.47 is support. Alternative scenario: the downside breakout of 3.47 would call for 3.03 and 2.77. Comment: the RSI is above its neutrality area at 50. The MACD is above its signal line and positive. The configuration is positive. Moreover, the stock is trading above both its 20 and 50 day MA (respectively at 3.53 and 3.49). Xinyuan Real (ADR) is currently trading near its 52 week high reached at 3.99 on 06/01/16. Our pivot point stands at 9.1. Our preference: the upside prevails as long as 9.1 is support. Alternative scenario: the downside breakout of 9.1 would call for 8.2 and 7.7. Comment: the RSI is above 50. The MACD is positive and above its signal line. The configuration is positive. Moreover, the stock is trading above both its 20 and 50 day MA (respectively at 9.43 and 9.97). Our preference: long positions above 702.00 with targets @ 735.00 & 746.00 in extension. Our preference: long positions above 95.30 with targets @ 98.40 & 99.00 in extension. Alternative scenario: below 95.30 look for further downside with 94.20 & 93.20 as targets. Our pivot point stands at 52.7. Our preference: short term rebound towards 64.3. Alternative scenario: the downside breakout of 52.7 would call for 48.6 and 46.2. Comment: the RSI is below 50. The MACD is negative and above its signal line. The configuration is mixed. Moreover, the stock is trading above its 20 day MA (56.33) but under its 50 day MA (57.15). 20.1 is our pivot point. Our preference: short term rebound towards 22.9. Alternative scenario: the downside breakout of 20.1 would call for 19.1 and 18.6. Comment: the RSI is below 50. The MACD is negative and above its signal line. The configuration is mixed. Moreover, the share stands above its 20 day MA (20.91) but below its 50 day MA (22.01). Our pivot point stands at 76.4. Our preference: the upside prevails as long as 76.4 is support. Alternative scenario: below 76.4, expect 72.2 and 69.7. Comment: the RSI is above 50. The MACD is positive and above its signal line. The configuration is positive. Moreover, the stock is trading above both its 20 and 50 day MA (respectively at 77.02 and 75.85). Our pivot point is at 65.8. Our preference: the upside prevails as long as 65.8 is support. Alternative scenario: below 65.8, expect 60.9 and 58. Comment: the RSI is above its neutrality area at 50. The MACD is above its signal line and positive. The configuration is positive. Moreover, the stock is trading above both its 20 and 50 day MA (respectively at 68 and 66.21). Mosaic Co Intraday: further upside. Our preference: long positions above 25.40 with targets @ 28.75 & 30.00 in extension. Alternative scenario: below 25.40 look for further downside with 24.00 & 23.10 as targets. CF Industries Intraday: further advance. Our preference: long positions above 34.40 with targets @ 39.20 & 41.00 in extension. Alternative scenario: below 34.40 look for further downside with 30.00 & 29.30 as targets. Our pivot point stands at 36.7. Our preference: short term technical rebound towards 36.7 before a new drop. Alternative scenario: the upside breakout of 36.7 would call for 38.3 and 39.3. Comment: the RSI is above its neutrality area at 50. The MACD is above its signal line and positive. The configuration is positive. Moreover, the stock is trading above its 20 day MA (34.92) but under its 50 day MA (35.66). 91.7 is our pivot point. Our preference: our next up target stands at 102.5. Alternative scenario: below 91.7, expect 87.8 and 85.6. Comment: the RSI is above its neutrality area at 50. The MACD is above its signal line and negative. The MACD must break above its zero level to trigger further gains. Moreover, the stock is trading above both its 20 and 50 day MA (respectively at 92.69 and 95.38). Our pivot point is at 131.3. Our preference: the upside prevails as long as 131.3 is support. Alternative scenario: the downside breakout of 131.3 would call for 125.9 and 122.8. Comment: the RSI is above 50. The MACD is above its signal line and positive. The configuration is positive. Moreover, the stock is above its 20 and 50 day MA (respectively at 134.09 and 133.46). Our pivot point stands at 131.2. Our preference: the upside prevails as long as 131.2 is support. Alternative scenario: the downside breakout of 131.2 would call for 124.2 and 120. Our pivot point stands at 3.59. Our preference: short term rebound towards 5.83. Alternative scenario: below 3.59, expect 2.81 and 2.35. Comment: the RSI is below its neutrality area at 50. The MACD is above its signal line and negative. The configuration is mixed. Moreover, the share stands above its 20 day MA (4.26) but below its 50 day MA (4.38). Our pivot point is at 1.31. Alternative scenario: below 1.31, expect 1.17 and 1.08. Comment: the RSI is above 50. The MACD is above its signal line and negative. The MACD must break above its zero level to call for further upside. Moreover, the share stands below its 20 and 50 day MA (respectively at 1.46 and 1.54). China Digital TV (ADR) is currently trading near its 52 week low at 1.38 reached on 12/02/16. AES Corporation Intraday: further upside. Our preference: long positions above 9.75 with targets @ 10.75 & 11.13 in extension. Alternative scenario: below 9.75 look for further downside with 9.40 & 9.20 as targets. Our preference: long positions above 717.00 with targets @ 746.00 & 759.00 in extension. Alternative scenario: below 717.00 look for further downside with 702.00 & 682.00 as targets. Our pivot point stands at 69.5. Our preference: the upside prevails as long as 69.5 is support. Alternative scenario: below 69.5, expect 66.7 and 65.1. Comment: the RSI is trading above 70. This could mean that either the stock is in a lasting uptrend or just overbought and that therefore a correction could shape (look for bearish divergence in this case). The MACD is positive and above its signal line. The configuration is positive. Moreover, the stock is above its 20 and 50 day MA (respectively at 69.84 and 71.76). 12.5 is our pivot point. Our preference: our next up target stands at 14.6. Alternative scenario: below 12.5, expect 11.8 and 11.4. Comment: the RSI is above its neutrality area at 50. The MACD is negative and above its signal line. The MACD must break above its zero level to call for further upside. Moreover, the stock is above its 20 and 50 day MA (respectively at 12.88 and 13.2). 51.2 is our pivot point. Our preference: the upside prevails as long as 51.2 is support. Alternative scenario: the downside breakout of 51.2 would call for 48.9 and 47.5. Comment: the RSI is trading above 70. This could mean that either the stock is in a lasting uptrend or just overbought and that therefore a correction could shape (look for bearish divergence in this case). The MACD is above its signal line and positive. The configuration is positive. Moreover, the stock is trading above both its 20 and 50 day MA (respectively at 51.98 and 52.41). Our pivot point stands at 65.1. Our preference: the upside prevails as long as 65.1 is support. Alternative scenario: below 65.1, expect 60.8 and 58.1. Comment: the RSI is above 50. The MACD is above its signal line and positive. The configuration is positive. Moreover, the stock is trading above both its 20 and 50 day MA (respectively at 68.2 and 66.25). Our preference: long positions above 53.00 with targets @ 57.00 & 57.40 in extension. Alternative scenario: below 53.00 look for further downside with 51.95 & 51.45 as targets. Western Digital Intraday: further advance. Our preference: long positions above 45.20 with targets @ 49.85 & 51.20 in extension. Alternative scenario: below 45.20 look for further downside with 42.60 & 41.25 as targets. Our pivot point stands at 53.5. Our preference: the upside prevails as long as 53.5 is support. Alternative scenario: the downside breakout of 53.5 would call for 49.7 and 47.5. Comment: the RSI is above its neutrality area at 50. The MACD is above its signal line and positive. The configuration is positive. Moreover, the stock is trading above both its 20 and 50 day MA (respectively at 56.32 and 56.89). Alternative scenario: the downside breakout of 20.5 would call for 19.5 and 19. Comment: the RSI is above 50. The MACD is negative and above its signal line. The MACD must break above its zero level to trigger further gains. Moreover, the share stands above its 20 day MA (20.89) but below its 50 day MA (21.86). Exxon Mobil ST: further upside. Our preference: long positions above 77.00 with targets @ 87.50 & 90.15 in extension. Alternative scenario: below 77.00 look for further downside with 71.75 & 66.50 as targets. Comment: the RSI is bullish and calls for further advance. Prices broke above a short term declining channel. The stock is outperforming its energy sector. Our pivot point is at 77.5. Our preference: the upside prevails as long as 77.5 is support. Alternative scenario: below 77.5, expect 73.9 and 71.8. Comment: the RSI is above 70. It could mean either that the stock is in a lasting uptrend or just overbought and therefore bound to correct (look for bearish divergence in this case). The MACD is above its signal line and positive. The configuration is positive. Moreover, the stock is trading above both its 20 and 50 day MA (respectively at 73.41 and 72.49). Target is currently trading near its 52 week high reached at 85.81 on 23/06/15.